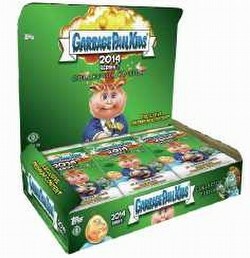 The Garbage Pail Kids 2014 Series 1 Collectors box contains 24 packs. Each pack includes 8 cards. Every pack is guaranteed to contain 1 Black Parallel OR Medal Insert, 1 Metallic Red Parallel, and 1 Full Bleed Canvas Parallel. Every box contains 1 Hobby Bonus Sticker (8 subjects), 1 Blank Back Parallel, 1 Cloth Sticker OR Sepia Parallel, and 1 Texture Relic OR Die Cut Sketch OR Autograph OR Printing Plate.